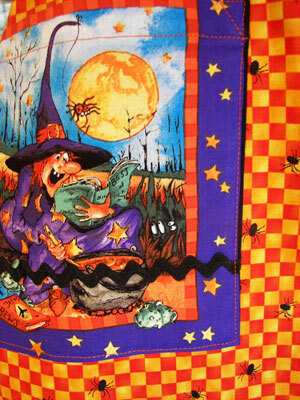 Halloween Hokus Pokus Apron with spiders,witches ghosts and all the fun things you enjoy at Halloween. 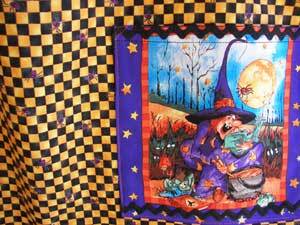 Halloween Hokus Pokus Apron to decorate yourself this Halloween. An old fashioned apron to wear in the kitchen for extra fun this Holiday Season. Apron pockets different sizes with fun pumpkins, withes and ghosts for an added whimsical touch. Halloween apron, a decoration on you. The Cutest Halloween Decoration will be on you. 1940 Apron in fanciful yellow / orange gingham with black spiders. Assorted pockets of witches, pumpkins and all the things you think of on Halloween. 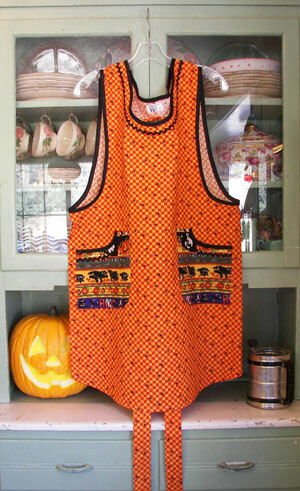 The top of this pretty retro apron is a combination of black cats, pumpkins and much more. Decorate yourself and the house in this pretty Halloween apron, it can be your Halloween costume throughout all the Holidays. Black trim and black rick rack make this the perfect Halloween Apron. Mother Daughter Halloween Costumes, and aprons you can enjoy during the Holidays! Halloween table runner with fun witches, goblins or pumpkins. Halloween decoration for your kitchen, living room or anywhere else in the house. This is a close up of the orange and yellow gingham check with black spiders. Halloween decorations (your apron) to last for years. Halloween is the start of the Holiday season. Enjoy a fun apron for Halloween, a great way to jump start the holidays. Halloween Decorations for the house, you will be the decoration in your Halloween Apron! A fun Halloween apron that you can decorate yourself this holiday season. 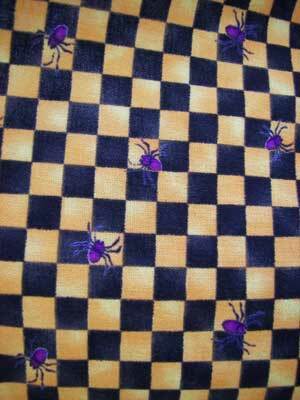 Black spiders on orange and yellow gingham with fanciful pockets of witches, pumpkins, ghosts, moon, bats and goblins. The Perfect Halloween apron decoration. 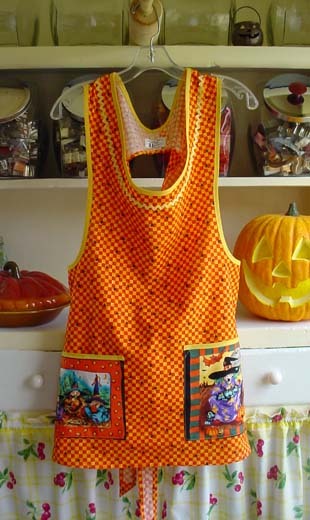 Each Halloween apron has a variety of pockets with different pictures and sizes. 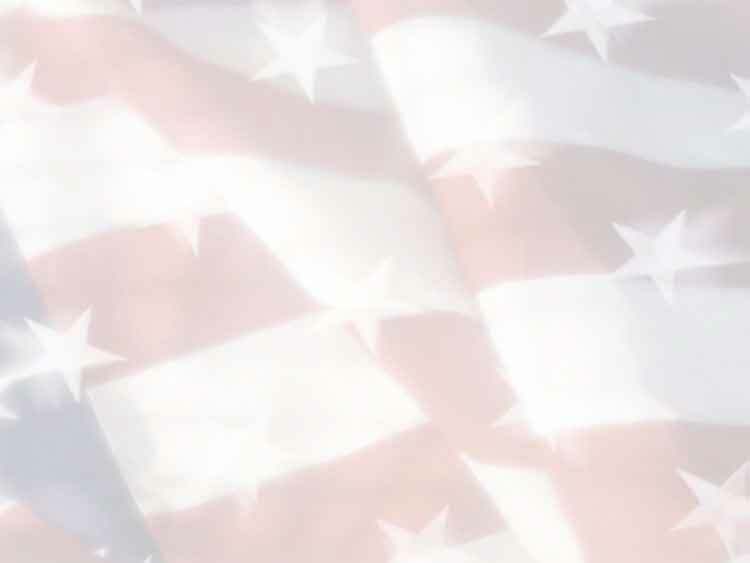 You'll love the look. 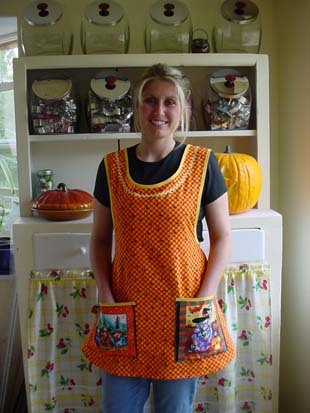 Rick rack around the top of Halloween apron with matching trim on arms, neck and top of pockets. Old Fashioned Halloween apron you will enjoy. If you are a Halloween fan this apron is a must! Each pocket of the Hokus Pokus apron is a different fun scene. Witches, pumpkins, or ghosts with spiders on orange gingham on the apron. Rick rack around the neck for that old fashioned look. Hokus Pokus Apron rests comfortably on your shoulders so it doesn't pull on your neck. Apron size is small, medium, large and ex-large. Women apron #2189 $49.95 ex-large add $54.95, Girl Halloween Apron #33026 Child Large $44.95. A classic Halloween apron with beautiful black white and ivory decorated pumpkins. Silver and shimmering gold highlights with black and white gingham to add to the Halloween look. A very elegant Halloween apron. Grey background with decorated pumpkins, silver and shinny gold adornment make this a very classic looking apron. 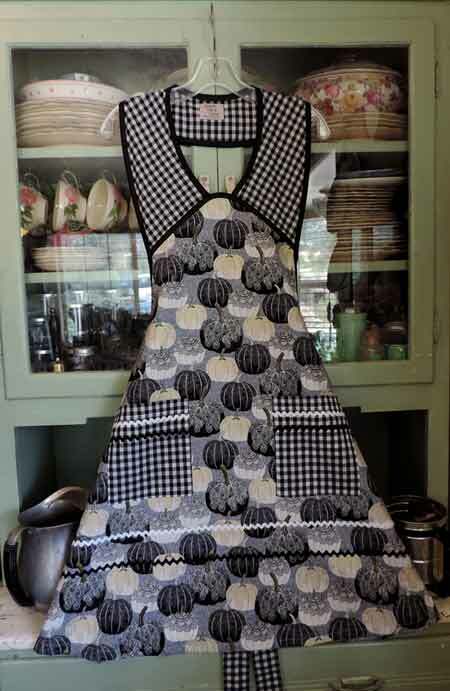 The 1940 apron has black and white gingham on the top and pockets. The Grandma and Aunt Violet has black and white gingham on the pockets. 1940 Apron in Autumn Leaf. 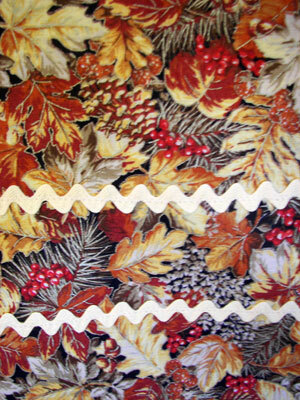 A spray of autumn leaves, gold and multicolored brown with red berries, a bouquet of fall. Gold and white contrasting gingham with matching ric rac add to the beauty of the apron. An apron you may wear throughout the holidays of anytime of the year. 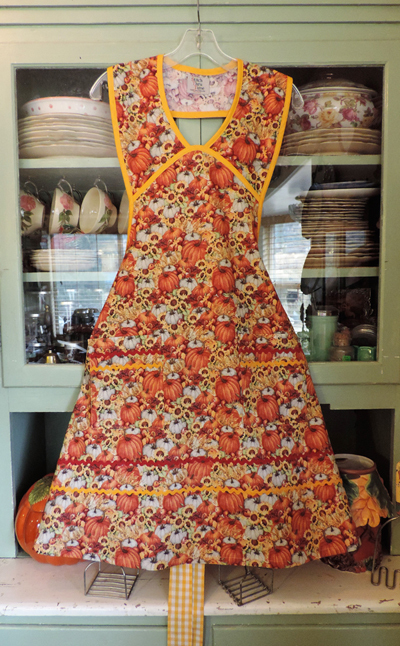 Fall is in the air with the 1940 Apron in Autumn Leaf. A spray of autumn leaves, gold and multicolored brown with red berries, a bouquet of fall. Gold and white contrasting gingham with matching rick rack add to the beauty of the apron, a very pretty fabric. An apron you may wear throughout the holidays of anytime of the year. Not only will you wear this apron on Halloween, but you can wear it year round because it is so cute. Order your Halloween apron early so you can wear it through the Holiday! Girl Apron #33021 $39.95 large $54.95. A beautiful Holiday apron for Thanksgiving and all through the Holidays! 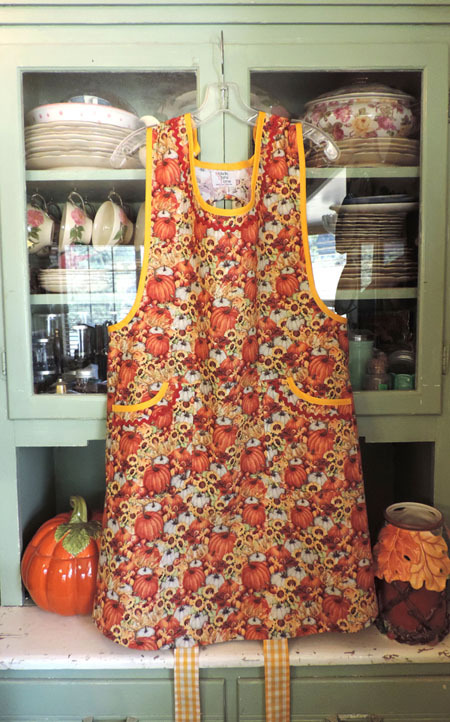 Pumpkins, sunflowers, berries and a burst of flowers will make this an apron you will enjoy for years. Round or Square pockets available extra large $54.95. Thanksgiving in a in a comfortable old fashioned grandma apron. 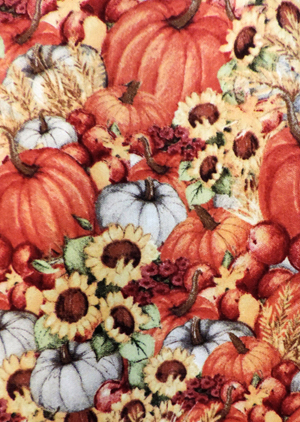 This pretty apron with harvest pumpkins and flowers will rest on your shoulders not your neck. You'll feel ready for the holiday season in this beautiful apron that will not only decorate you, but keep you clean. Pretty gold gingham apron ties with ric rac on the top and round or square pockets. Women Apron #2161 $49.95, extra large $54.95. 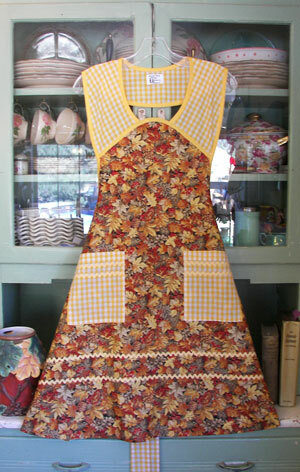 Old Fashioned cobbler style apron with pumpkins sunflowers and gold gingham apron ties. A beautiful apron for not just during the holidays but year round. 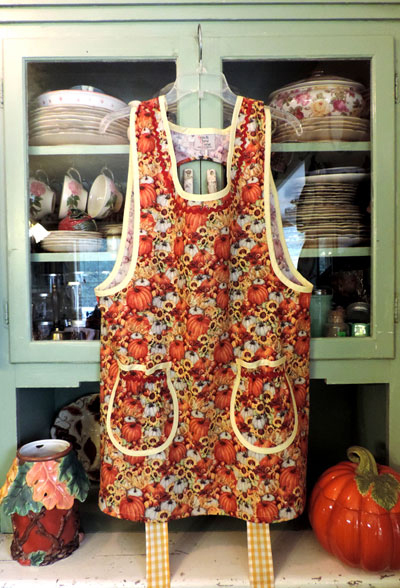 Start early with the Holidays with this beautiful apron that can be worn year round! Woman Halloween Apron #1052 $49.95, ex large $54.95. Hokus Pokus Halloween apron, a orange and black gingham with little purple spiders. 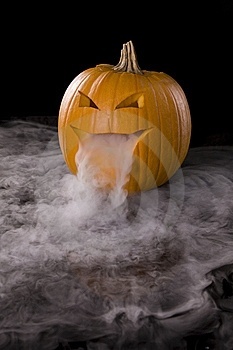 A Halloween decoration on you and you'll be the best decoration throughout your home on Halloween. Black and orange gingham and purple spiders on the apron with old fashioned black ric rac and trim finishing off your Halloween holiday apron. Above apron shown in woman large. Close up of Halloween aprons in black/orange. Purple spiders, goblins, witches, pumpkins, all the things you think of with Halloween. 1940 apron also comes in this pretty black yellow gingham with purple spiders. 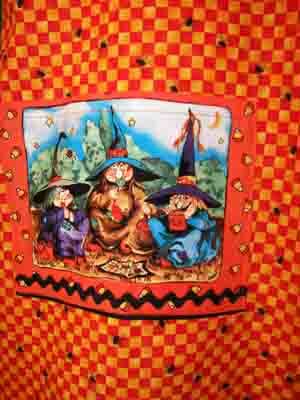 Hokus Pokus Halloween Apron #144 $49.95, extra large $54.95. 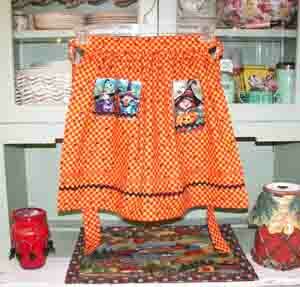 Halloween Apron of orange and yellow gingham check with small purple spiders, yellow rick rack and trim. 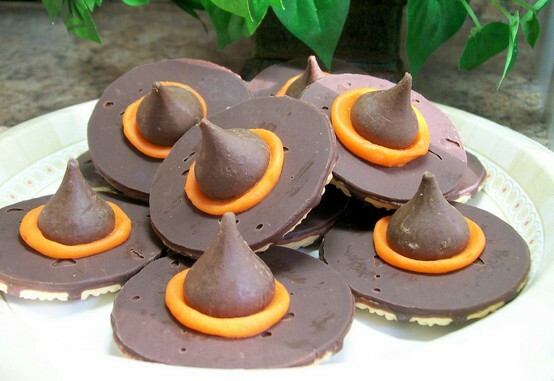 Fanciful Halloween pockets with witches, pumpkins, ghosts and everything you like about Halloween. Halloween apron pockets are different sizes, which add to the whimsical look of this fun apron. Halloween Table Cloth, pretty Decorations with fun pumpkins, witches, spiders on Halloween gingham. 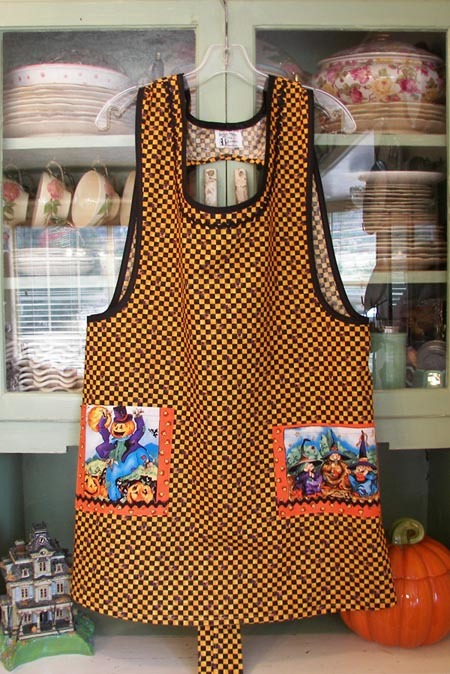 Halloween aprons come with different fanciful center, some are witches, some pumpkins, and jack-o'-lantern's. 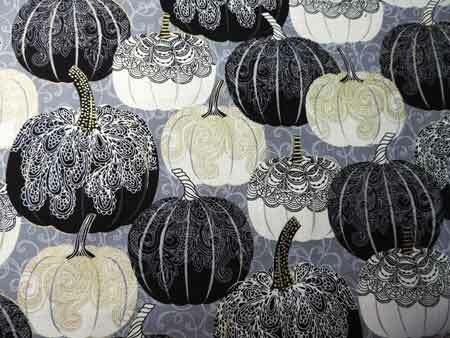 Each is a fun addition to this beautiful Halloween table cloth that will last for years. 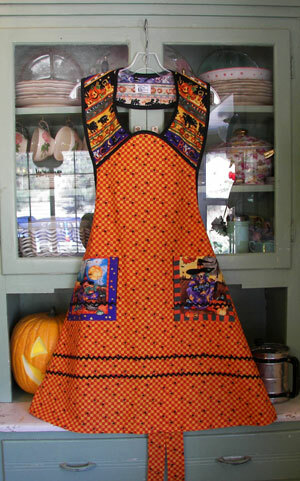 Dress up for Halloween in this pretty Halloween apron. Black spiders on orange / yellow check. Halloween pockets your sure to enjoy with black rick rack and trim will make this a fun Halloween costume. Woman Halloween #144 $49.95, extra large $54.95. Hokus Pokus Orange / Yellow Half apron. 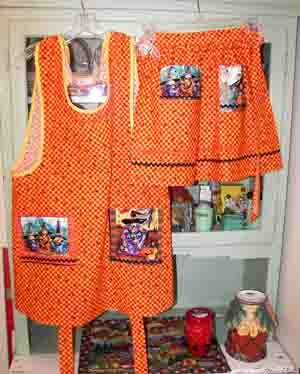 Women half apron #306 $47.95, extra large $52.95. Child half apron #404 $39.95. 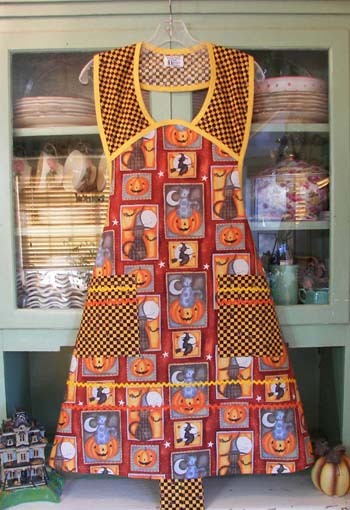 Halloween half apron with whimsical pockets. Orange/Yellow checks with black spiders. 4 different assorted pockets come on this cute apron. Above Halloween half apron comes in mother or child aprons. Black and orange rick rack on the bottom of apron with black rick rack on the pockets. You may also get this in black orange hokus pokus material with purple spiders. Women Halloween Half Apron #306 $47.95, extra large $52.95. Apron above shown in the child apron, one size only. Child Halloween Apron #314 $39.95, large $44.95. 1940 Cats Bats Witches Pumpkins and the Halloween moon. A fanciful Halloween apron. A whimsical Halloween apron that is perfect to decorate yourself with. Halloween decorations for you! Mother Daughter Halloween Costumes, and fun aprons you can enjoy during the Holidays together! 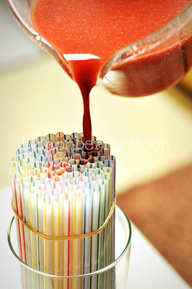 Pour jello into straws to make worms!